The interface is very interesting, as a troll you can only Kick, Grab, Smash, Bite and Roar. 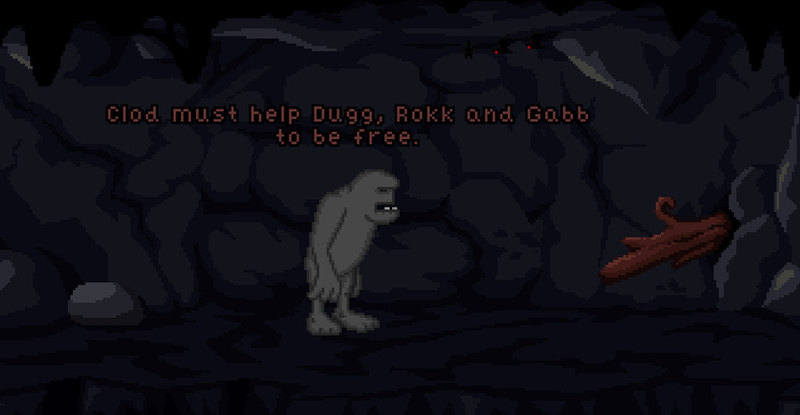 Roaring is fun and oftentimes helps you to move on... the graphics are nice pixelart but a bit dark to see every hotspot, but what do you expect in a dark cave. 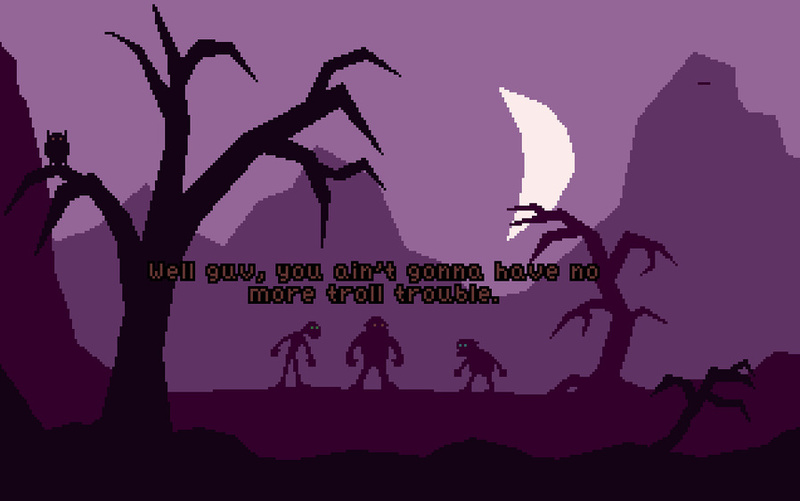 The trolls are fun to watch, their animations are very fluid and puzzles keep you engaged but sometime a bit left out of some better clues, so you somehow know what is going on. But Clod not say much..
A very good game. Not only were the graphics and voices well done and the puzzles clever but the story was intriguing. I want to know what happens next! These trolls rock! Roaring at things is fun. Inbuilt hints and show hotspot features are handy. Well done Team Disaster. I strongly recommend you to play this first part. It is short but intensive and catched me right from the start. A classic point & click adventure game with interesting options to act that makes solving the puzzles unique and fun. The well done voice acting and cute characters are entertaining. I am eagerly looking forward to discover the complete story. This was a really fun game. I am really looking forward to the rest of the game. Charming little introductory chapter into what looks to be a very interesting story! The art was consistent with nice animations, there was a great pacing to the game overall. Looking forward to the next verse. A wonderful and quite touching first chapter of what will hopefully one day be a ground (or rock) breaking full game. It will be if the quality present in this first part is maintained throughout the whole anyway. Brilliant - fun and unique, great voice acting and characters, really looking forward to the full version! There's a dignity and strength to this Troll that immediately grabs the player. I felt like I was part of the quest and that I had a good reason to accomplish it. The game is very well written for a team of Trolls (joke) and the voices superb. It's really fun to play this game and I can't wait to play the rest of it! Good job guys!